In a post-“Twilight” world, where crap is the norm, it’s okay to be skeptical of the arrival of a popular new YA series, especially if it’s received explicit comparisons to “Twilight.” So how does “Beautiful Creatures” measure up as an attempt to ride the coattails of Stephenie Meyer and as a film in its own right? Well… it’s not good, but it could have been so much worse. 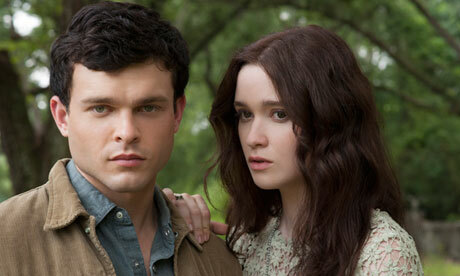 Alden Ehrenreich and Alice Englert have believable, borderline fantastic chemistry, but “Beautiful Creatures'” poorly crafted characters leave us wanting so much more. In a bad way. Photo from The Guardian. The plot is basically a gender-flipped “Twilight,” with Casters (read: witches) instead of vampires, with a few twists. Ethan Wate (Alden Ehrenreich) has lived in the sleepy town of Gatlin, South Carolina all his life, longing to lead a more exciting life. He gets a chance when he meets Lena Duchannes (Alice Englert), the first new girl in town in a long time. Her family is rumored to be devil-worshippers, and she seems to bring trouble everywhere she goes. Eventually, Lena reveals that she is a Caster, and on her 16th birthday she will be “claimed” for either light or dark magic. As romance blossoms between the two, Lena’s uncle Macon Ravenwood (Jeremy Irons) and the evil Sarafine (Emma Thompson) duke it out over which path Lena will take. Actually, that’s not even half of what’s going on in “Beautiful Creatures.” The film tries to be a coming-of-age story, a mythology arc for the town of Gatlin and Casters, a love story, a good-versus-evil showdown and a morality play all at the same time. That’s very adventurous, and there are some interesting ideas here, but with all those plotlines vying for screen time without sufficient development, the film feels both underwritten and overcooked, as though writer-director Richard LaGravenese was trying to please everyone, but could only finish it off with a weak climax. For instance, the love story begins with some snarky banter, a little chemistry, then boom – Ethan and Lena are madly in love (or so the script tells us). The world building isn’t much better. There’s a throwaway line about Casters fighting in wars with mortals (neat), and we see a tunnel that supposedly connects Casters across the States, but all we ever see Casters do is flounce around mansions and fields while wearing elaborate costumes and being melodramatic in ways that would make theater majors blush. There’s also the matter of Lena’s “claiming:” She can choose between Light and Dark. No, she can’t. Yes, she can. Pick one already. In addition, most of the characters lack development beyond basic traits. For example, Ethan is a baffling choice for a lead, since he doesn’t really have any defining personality beyond the fact that he reads Vonnegut and Bukowski, and he runs. Even more baffling is the decision to keep bringing the focus back to him, when it should be Lena’s story, since she’s the one with actual character (she’s moody, likes to keep her distance from others and would rather hide her emotions) and an arc (not a great arc, but still). Apparently it’s not enough to let her loner traits speak for themselves, they have to make everyone else in town a mean girl or a Bible-thumping, hellfire-spouting Jesus freak, too. Truly, this is a Southern town that could only exist in Movieland. The tone of the movie is all over the map as well. It’s clear that LaGravenese couldn’t decide whether he wanted to make a parody of “Twilight”-esque crap or a straight example, so the script lurches between lampshading clichés (which admittedly scores some laughs) and playing them dead straight, leaving the poor actors adrift. Her character could be one-note and irritating in less capable hands, but Emmy Rossum works her inner femme fatale it in “Beautiful Creatures.” Photo from Collider. And yet, despite all these flaws, it’s not an unwatchable disaster. Even when the script lets them down, the actors are far more engaging than anyone in “Twilight” ever was. In particular, Englert and Ehrenreich share an easy chemistry that helps the romance seem less forced, and both remain intensely watchable. Thompson’s playing a cardboard cutout villain, but she has a ball with it, putting on a hideous accent and hamming it up to the extreme. Viola Davis and Emmy Rossum have thankless roles as the requisite mother figure to Ethan and the resident “evil whore,” respectively, but they sell their roles and add hidden depths to thin writing. The stylistic choices, while scattered, are also interesting to behold. The film comes off as a pastiche of “Charmed’s” kitschy (but occasionally very impressive) digital effects, Tim Burton’s sumptuous gothic baroque and zippy pace and a Lady Gaga concert, which makes for a bizarre but visually stimulating (and never boring) experience. The score is also lush and distinctive, but never overpowering.